The last known photograph of Collins alive was taken as he made his way through Bandon, County Cork in the back of an army vehicle. He is pictured outside White’s Hotel (now Munster Arms) on 22 August 1922. On the road to Bandon, at the village of Béal na mBláth (Irish, “the Mouth of Flowers”), Collins’ column stopped to ask directions. However the man whom they asked, Dinny Long, was also a member of the local Anti-Treaty IRA. An ambush was then prepared for the convoy when it made its return journey back to Cork city. They knew Collins would return by the same route as the two other roads from Bandon to Cork had been rendered impassable by Republicans. 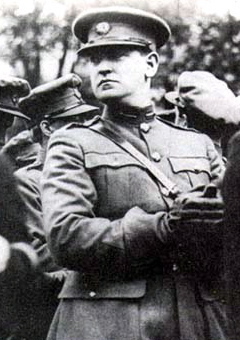 The ambush party, allegedly commanded by Liam Deasy, had mostly dispersed to a nearby pub by 8:00 p.m., when Collins and his men returned to Béal na mBlath but the remaining five ambushers on the scene opened fire on Collins’ convoy. The ambushers had laid a mine on the scene, which could have killed many more people in Collins’ party, however they had disconnected it by the time the firing broke out. Collins was killed in the subsequent gun battle, which lasted approximately 20 minutes, from 8:00 p.m. to 8:20 p.m. He was the only fatality in the action. He had ordered his convoy to stop and return fire, instead of choosing the safer option of driving on in his touring car or transferring to the safety of the accompanying armoured car, as his companion, Emmet Dalton, had wished. He was killed while exchanging rifle fire with the ambushers. Under the cover of the armoured car, Collins’ body was loaded into the touring car and driven back to Cork. Collins was 31 years old; At the time of his death, he was engaged to Kitty Kiernan. There is no consensus as to who fired the fatal shot. The most recent authoritative account suggests that the shot was fired by Denis (”Sonny”) O’Neill, an Anti-Treaty IRA fighter and a former British Army marksman who died in 1950. This is supported by eyewitness accounts of the participants in the ambush. O’Neill was using dum-dum ammunition, which disintegrates on impact and which left a gaping wound in Collins’ skull. He dumped the remaining bullets afterwards for fear of reprisals by Free State troops. Collins’ men brought his body back to Cork where it was then shipped to Dublin because it was feared the body might be stolen in an ambush if it were transported by road. His body lay in state for three days in Dublin City Hall where tens of thousands of mourners filed past his coffin to pay their respects. His funeral mass took place at Dublin’s Pro Cathedral where a number of foreign and Irish dignitaries were in attendance.